Teller of tales. Lover of words. Writer of stories for children & young adults. 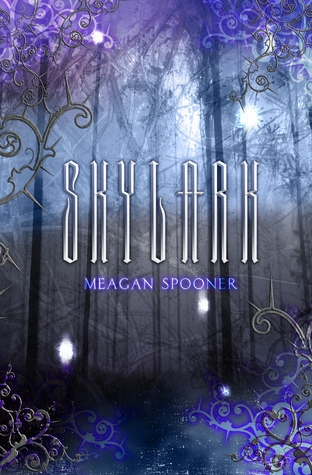 Late last week, I downloaded Meagan Spooner’s debut SKYLARK into my iPad’s Kindle. I was eager to start reading, though I was in the midst of grading (grades are due by tomorrow morning—eek!) and my own MS revisions. So I started slowly. One chapter at a time, squeezed in between all else. The problem with me (is it really a problem? I beg to differ) is that once I’m hooked, I can’t stop. It was torture reading just one chapter at a time, and finally, I couldn’t do it anymore. I told my husband, as he went to sleep last night, “I’m just going to finish this chapter and then go to sleep.” Because I was exhausted. But I didn’t. I kept reading, enthralled in this magical, dangerous world, each chapter ending in such a way that I had to read just one more chapter. And so it went until I finished it a little past 1 AM, when my iPad’s battery had only 4% juice left and my eyes were blearing from exhaustion. “Vis in magia, in vita vi. In magic there is power, and in power, life. For fifteen years, Lark Ainsley waited for the day when her Resource would be harvested and she would finally be an adult. After the harvest she expected a small role in the regular, orderly operation of the City within the Wall. She expected to do her part to maintain the refuge for the last survivors of the Wars. She expected to be a tiny cog in the larger clockwork of the city. Lark did not expect to become the City’s power supply. For fifteen years, Lark Ainsley believed in a lie. Now she must escape the only world she’s ever known…or face a fate more unimaginable than death. For one, I’m a sucker for gorgeous language and descriptions. Her prose is lyrical and beautiful and takes me right there. I could picture the scenery, the buildings, the forest, the characters. It was such rich and vivid imagery. The world is unlike any other and yet it was familiar. I understood it and feared it. From the city in which Lark lives, cut off from the rest of the world, to the vast unknown world Lark encounters on her journey, Meagan Spooner delivers. She brings to life the beautiful and dangerous, the friendly and lethal. And the magic. Wow. I love Lark. She’s strong and fights for what (and whom) she loves, even if it means taking the hard way out or sacrificing herself. And Oren. ❤ 🙂 And Tansy and Nix (awww love Nix!). Even Kris. These characters have heart and soul and that makes me love them and root for them. I’m so anxious to see what happens to them in the next book! I’m invested in the characters, even the bad guys. I also really liked the pace, which quickened and slowed in natural progression, as well as the sense of discovery that accompanies Lark’s entrance into an unfamiliar landscape.